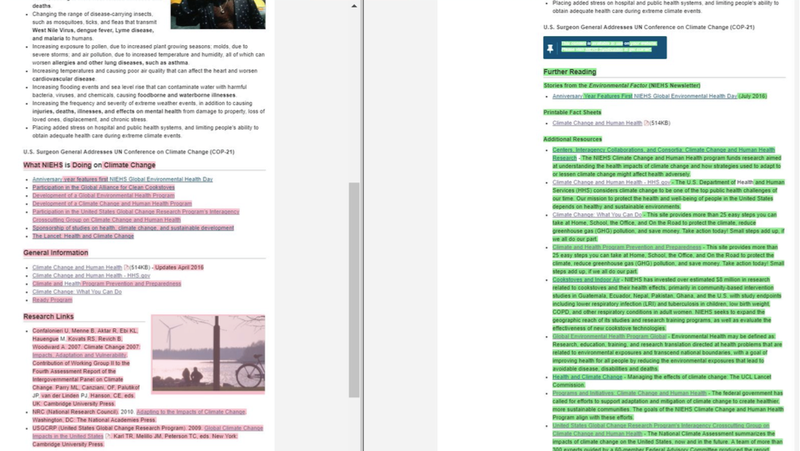 Data-tracking watchdog group, Environmental Data & Governance Initiative (EDGI), has reported dozens of instances where the National Institute of Environmental Health Sciences has deleted references to climate change from its site. Obviously, “climate” is not the same as human-driven climate change. But eliding that difference casts climate change as something abstract or distant. It’s not. It’s real, it’s tangible and its effects have an enormous impact on people’s health. Unfortunately, the NIEHS is failing in its mission to inform people of this. Among the removals is a fact sheet, “Climate Change and Human Health” that lists the immediate health impacts of climate change. Though still hosted on the site, the links have been removed and its no longer listed on the NIEHS’ Brochures and Fact Sheet page. The fact sheet regionalizes weather effects like extreme heat, flooding and poor air quality and connects them to climate change, summarizing how climate change has an outsized impact on specific vulnerable populations—the elderly, pregnant women, low income and indigenous groups. These groups are both the most vulnerable to the effects of climate and are the clear targets of campaigns meant to mislead on the dangers of climate change. The latests revisions in the NIEHS only compound with similar deletions on the Department of Energy and Environmental Protection Agency websites. They’re falling in line with the Trump administration’s stance on climate change: deflection (senior officials admitting they “haven’t asked” if the President believes in climate change,) and casting the consensus as a “both sides” debate. Further, it works against the newer, soft rebranding of climate denial employed by EPA head Scott Pruitt—this pernicious idea that the science of climate change is unsettled and no cause for alarm. But if climate change doesn’t pose a threat, then why are they so afraid of it?